Welcome to Module 3, and congratulations on successfully completing Module 2! I hope you enjoyed applying your energy, sustainability, and critical analysis skills to the media selections from the last lesson. In this lesson, you will begin reading the first of the two main artifacts that you will be analyzing this semester. The first artifact is the book The Sixth Extinction: An Unnatural History, by Elizabeth Kolbert. I want you to think critically about the book as you read it, especially with regards to how the content relates to sustainability (all 3 E's) and the ability of humans to live within the ecological limits of the planet. It is important that you think as objectively as possible, trying to see past preconceived ideas, and consider the science behind the writing. It is important that you look at the specifics of your self-reflection paper in Module 10 before you begin reading the book, because it will indicate key pieces of information to focus on. analyze the evolution of your own thinking with regards to key energy and sustainability issues related to the book. Please note that the quiz can only be taken once. This test is timed - you have exactly 1 hour to complete it once you begin. You cannot stop and save - it must be completed in one sitting. Once you submit the quiz, you cannot change answers. All saved answers will automatically be submitted at the deadline if you have not submitted them. The test is not meant to be "tricky," or even to dig deeply into the material. It will consist of two components: First, a review of key concepts from Lessons 1 and 2. Second, it will cover major facts and/or themes from the reading. Again, these questions will be relatively straightforward. There will be no essay questions. I strongly encourage you to look over at least the "Language of Energy and Sustainability" term list at the end of Lessons 1 and 2 to prepare for this week's quiz. I'm happy to help you review. If you have any general course questions or questions about this lesson's content, please post them to our HAVE A QUESTION? discussion forum located under the Modules tab in Canvas. I will check that discussion forum regularly to respond as appropriate. While you are there, feel free to post your own responses and comments if you are able to help out a classmate. If you have a question but would like to remain anonymous to the other students, e-mail me through Canvas. If you have something related to the material that you'd like to share, feel free to post to the Coffee Shop forum, also under the Modules tab in Canvas. For this lesson, there is no content, other than reading the book. If you have any questions about the content, or what you are required to do, please contact me. 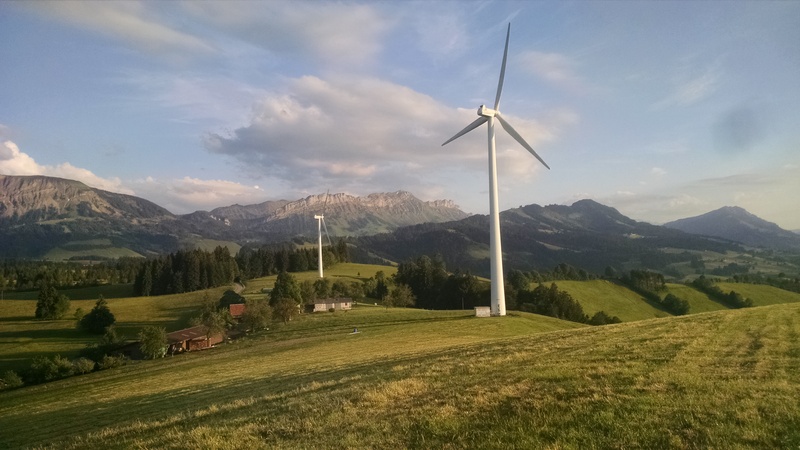 Since there is no content to post I figured I'd share some energy- and sustainability-related photos with you from my time in Switzerland. I will be taking students there this spring, then again in 2021. As ESP students you can enroll in the 2021 course and get your 3 Foreign Studies credits, as the travel comes after an online 3-credit Alternative Energy Technologies course. If you are not an ESP student, you are still welcome to enroll! You would learn a lot about renewable energy before you travel, then see a lot of renewable energy and sustainability installations first hand while traveling. You can click on each image to view a larger image, if you are so inclined. Enjoy! Figure 8.1: This is one of my favorite photos from Switzerland. We are standing at the top of a small mountain in the Entlebuch region of Switzerland. The entire region is a UNESCO biosphere reserve . We visited a family that grows organic herbs, mostly for Ricola. Alas, we did not get to see the turbines any closer. Figure 8.2: In this picture, we are starting our tour of the Musegg Solar Farm. This array generates nearly 80,000 kWh of electricity each year. For some context, this is enough to operate about seven "average" U.S. homes for a year. Figure 8.3: In this image, Walter (who takes care of the farm and castle wall, but works in the Energy Office in Zug) shows us the '57 Chevy that he personally retrofitted to run entirely on electricity, using 100% solar energy of course! We later had a BBQ with him on the farm. Figure 8.4: This is the Musegg Wall in Lucerne, with most of the original stone from 1386. It is the old castle wall, and the tower you see in the foreground has a tunnel big enough for cars to go through. (The tunnel was added well after the tower was built, of course!) The farm is behind the yellow building on the left, and the city of Lucerne - where we stay for the first five days of our trip - is to the right. Figure 8.5: Here is a view looking south over Lucerne from the castle wall. You can walk the length of the wall, and there are nine towers on the wall, complete with arrowslits and battlements, and one clock tower. You can see Lake Lucerne in the background, and the Swiss Alps (snow caps and all) behind it. It's really neat that there is a small solar farm about 100 meters behind us as we look over this bustling, historic city. Figure 8.6: This is one of the many cooperative housing units in Zurich. The name of this complex is Mehr als Wohnen ("more than housing"). Each unit has multiple rooms with a shared kitchen and common area, and if you live here you are not allowed to have a car or a washing machine. You should see the bike racks in the basement! The entire complex is owned and run by the residents, including a restaurant and a few other businesses. There are around 1200 people living in nearly 400 apartments in 11 buildings. They even promote art by requiring that a minimum of 0.5% of the down payment from each person must by used for art. Coops are very popular in Zurich, as they are subsidized by the city government, and are less expensive than standard apartments in Zurich. Incidentally, Zurich is one of the most expensive cities in the world. Figure 8.7: Finally, here is a picture of the inside of a waste incineration plant in Zurich. They generate 110,000 MWh of electricity by "thermally recycling" 230,000 tonnes of waste each year. They recycle all metals that can be pulled out before incinerating the waste. It's quite an amazing operation. Swiss engineering at its finest. Check the list of requirements on the first page of this lesson and the syllabus to make sure you have completed all of the activities listed before the due date. Once you've ensured that you've completed everything, you are welcome to move forward with Lesson 9. Complete all activities in Lesson 8, located under the Modules tab in Canvas. The quiz may include a variety of question types, such as multiple choice, multiple select, ordering, matching, true/false. Be sure to read each question carefully. This quiz is meant to make sure that you have an understanding of the core concepts from Lessons 1 and 2, and have read the book and paid attention while doing so. The questions should not take a lot of thought, as long as you know the material and paid attention while reading the book. For any other assignments (e.g., journal or discussion board), it will be helpful to look at the rubric before answering. You will see a button that allows you to view it below the assignment. The quiz is timed - you get exactly 60 minutes to complete it once you begin. Journal entries are not timed but do close at 11:59 pm EST on the due date as shown in Canvas. In this lesson, you will finish reading The Sixth Extinction: An Unnatural History. As in Lesson 8, I want you to think critically about the book as you read it, especially with regards to how the content relates to sustainability (all 3 E's) and the ability of humans to live within the ecological limits of the planet. It is important that you think as objectively as possible, trying to see past preconceived ideas, and consider the science behind the writing. Please note that the quiz can only be taken once. This test is timed - you have exactly 1 hour to complete it once you begin. You cannot stop and save - it must be completed in one sitting. Once you submit the quiz, you cannot change answers. All saved answers will automatically be submitted at the deadline if you have not submitted them. The test is not meant to be "tricky," or even to dig deeply into the material. It will consist of two components: First, a review of key concepts from Lessons 3, 4 and 5. Second, it will cover major facts and/or themes from the reading. Again, these questions will be relatively straightforward. There will be no essay questions. I strongly encourage you to look over at least the "Language of Energy and Sustainability" term list at the end of Lessons 3, 4, and 5 to prepare for this week's quiz. I'm happy to help you review. Just like Lesson 8, there is not additional content for this Lesson, other than finishing the book. If you have any questions about the content, or what you are required to do, please contact me. This time (if you feel like it), try to guess what the image below shows. Hint: It is energy-related. Figure 9.1: See below for the explanation for this mystery photo. This picture was taken below ground on the campus of ETH Zurich, which is essentially the "MIT" of Switzerland and the top research institution in Switzerland. ETH Zurich has a plan to be carbon free by 2025, and these pipes will play a role in that. These pipes are a few feet in diameter. They carry warm and cold water to and from a deep wells (over 500 feet deep) that are used to store water warmed by "waste" heat in the summer, to be used for heating in the winter, and cold water in the winter, to be used for cooling in the summer. The image below shows a schematic of this system. The concept is relatively simple, but the engineering is fairly complex. The video below is entirely optional, but it might be nice to put a face and voice to the words in the book. I think it's pretty interesting to hear her discuss some of the events in the book from a first-person perspective. Note that Paul Broun, whose comments are featured at the end of the clip, is no longer in Congress. The last few minutes offer some interesting food for thought I think. Feel free to post your thoughts to the Coffee Shop. FYI, Democracy Now! is a great source for independent media analysis. Enjoy! To say a chilling title like the sixth extinction, so take it forward what does that mean exactly. Well as Aaron mentioned there have been five previous I guess we call them major mass extinctions, because i should say there's a sort of an oxymoron. You can also have a minor mass extinction but there are five major ones that we see in the fossil record. The most recent being the asteroid impact that killed off the dinosaurs, and so now human impacts on the planet burning fossil fuels acidifying the oceans cutting down the rainforests just altering the surface of the earth. Moving species around has an enormous effect. You know you everyone sort of invasive species but we are we are moving so many species around the world we're really sort of reverse engineering the planet. In effect, bringing all the continents back together so all of these things have the unfortunate side effect of causing extinction. Explain what you mean by reverse engineering by spreading the species around the planet. Well we, you know, just in ballast water. For example just to take an example, it's estimated that 10,000 species are being moved around in ballast water. Explain what ballast would in our super tankers you know they have these huge tanks of water ballast to stabilize the ship and they contain lots of creatures you know some are very very Chinese that were less tiny, but you're moving them around and that has from ocean to ocean. Right so, imagine you know pre Panama Canal people the Atlantic and the Pacific. If you lived had evolved in the Atlantic or evolved in the Pacific you'd evolved separately for many many millions of years, you bring these lineages together and it can have many impacts some of which can be quite devastating. And everyone has heard stories of invasive species. There is a very famous story, for example, of a the brown tree snake which has been told you know many times the brown tree snake was brought from New Guinea to the island of Guam probably in military cargo in World War two. Guam had only one tiny native snake about the size of a worm. The snake had no enemies it went you know crazy multiplied like crazy and ate just about everything that it possibly could until it couldn't go on, so now a lot of Guam's native birds are either gone or very very critically endangered. So that's an example of what happens when you bring together organisms that have evolved separately for a very very long time. On the issue of the oceans, would you say that it's an overlooked part of the global warming debate, and the impact of carbon pollution on the oceans and what should people know about the dangers of humankind to the oceans. Well yeah that's a really big issue and Jane Lubchenco who was head of WHO until fairly recently has called ocean acidification global warming's equally evil twin and I think because we are terrestrial organisms we don't appreciate it as much, but a lot of our carbon emissions so a lot of what we're putting up into the air is ending up very very quickly in the oceans. It's absorbed by the oceans and when carbon dioxide dissolves in water it has the unfortunate effect of becoming an acid so we drink that acids very weak acid carbonic acid and you drink it when you drink Coke but it's still an acid and you put enough in the water and it changes the pH of the water. The chemistry of the oceans and that's what we're doing and that has you know potentially enormous ramifications because obviously if you're a creature whose only contact with the outside world to see the water it's a very big deal. Can you talk about George coo CA and the Alvarez father-and-son team and their fans and and their work yeah that's a really interesting sort of history of science you know story a rare instance were an idea you know came and went and came again and and George Cuvier was the great naturalist from the beginning of the 19th century so right around 1800 and he was the first person to really say organisms go extinct so to understand you know to appreciate how important that was when Thomas Jefferson sent Lewis and Clark to explore the Northwest he hoped they'd find live mastodons roaming around he really just couldn't believe even though he was very interested in fossils he had a fossil room at the White House when he was there he couldn't believe these animals had gone extinct it just wasn't what happened it wasn't what the Creator you know had planned for them and George Cuvier came along and said you know really essentially if they're out there we would have seen them we haven't seen them they're gone and he posited this whole lost world which he then proceeded to start to uncover so a lot of the animal names that we have now for example pterodactyl he came up with he was the first person or identify a pterodactyl and his theory was that animals only went extinct in these catastrophic waves you know something happened the planet changed otherwise why else would they go extinct and then a natural named charles lyell who is Charles Darwin's mentor came along and he said that's ridiculous you know we never see these catastrophes they don't happen only the only way the earth changes is very very very gradually and things go extinct very gradually in the world changes very gradually and that became sort of the doctrine for a very long time over a hundred years until the Alvarez's came along and identified an asteroid impact as the event that had done in the dinosaurs and many other creatures i should say the dinosaurs always get top billing but they that extinction event in a lot of other groups as well that was resisted that there is resisted but it was proved and now the sort of general theory is you know yes the earth changes very slowly except for these extraordinary moments and I'd say the whole point of writing the book is that we are in one of those moments right now. Talk about the panamanian Golden Frog the panamanian golden frogs it is a very sad story the panamanian golden frog is a beautiful frog it's a sort of taxicab yellow color and it lived it was considered a lucky symbol in Panama for many years you'd see it on lottery tickets in panel and 8a this is in case of an invasive species a disease pass through Panama disease that affects amphibians and it's raced through and people watch these frogs disappear not just the Panamanian go and far what many frogs disappeared and they fortunately had anticipated this they could actually watch it moving through and they took some of them out of the rain forest and they're now in a in a conservation center they can't leave we can't go outside but they're in this little Conservation Center in a town called El by I wanted to play for you a clip of Congress member paul brown he's of georgia chair of the oversight and investigations for House Science Space and Technology Committee this is video of him speaking in 2012 liberty baptist church in hartwell Georgia comes in and all this stuff I was tall about evolution of rheology Big Bang Theory all that is lies straight from the pillow and its line us to try to keep me and all the folks who are taught that from understanding that they need a savior you see there are a lot of scientific data that I found out as a scientist they actually showed that this is really a young earth I believe that Earth's but about man that you know I believe it's created in six days as we know that's what about ourselves that's Republican Congress member paul broun of georgia denying climate change exists coming up right now now we hear all the time about global warming actually we've had a flat line temperatures globally for the last eight years scientists all over this world say that the idea of human-induced global climate change is one of the greatest hoaxes perpetrated out of the scientific community it is a hoax those clips also highlighted on Bill Moyers program on PBS Congressman Paul Brown is not only just a congressman from georgia but he's chair of the oversight of chair of oversight investigations for the House Science Space and Technology Committee the significance of what he is saying both on the issue of evolution and climate change elizabeth kolbert well it's hard to overstate it I mean you you you have a situation where we really need to be taking serious action on climate change and we're still having this surreal I guess I would use the word debate over whether it's happening or not and I think a clip like that shows that you know people are really speaking entirely different languages we're just not even speaking to each other using you know we're using English but we're not really speaking the same language we're not looking at the same well some people are looking at scientific data and some people are not let me just put it that way and it's very very hard to carry on you know a reasonable sort of post-enlightenment conversation and what are the implications of this for policy well we all know it you know we all see the implications repository is no policy so you know people have essentially you've given up in this Congress on getting any kind of meaningful legislation through and the only hope of getting any kind of action on climate change now rests with the administration and the Obama administration know is that everyone knows that what needs to be done well. Check the list of requirements on the first page of this lesson and the syllabus to make sure you have completed all of the activities listed before the due date. Once you've ensured that you've completed everything, you are welcome to move forward with Lesson 10. Complete all activities in Lesson 9, located under the Modules tab in Canvas. The quiz may include a variety of question types, such as multiple choice, multiple select, ordering, matching, true/false. Be sure to read each question carefully. This quiz is meant to make sure that you have an understanding of the core concepts from Lessons 3, 4, and 5, and have read the book and paid attention while doing so. The questions should not take a lot of thought, as long as you know the material and paid attention while reading the book. I strongly suggest having the course content and book available while you are taking the quiz. For any other assignments (e.g., journal or discussion board), it will be helpful to look at the rubric before answering. Be sure to answer ALL elements that you are asked to do. The bulk, if not the entirety, of your analysis should be as evidence-based, defensible, logical, and as objective as possible. If you make an assertion, you need to provide at least a logical explanation, but, ideally, you will have verifiable facts to back it up. E.g., "Biodiversity is a serious problem" or "Humans are impacting biodiversity" are both weak arguments. You would need to provide data to back these statements up, and of course keep in mind the quality of the information source. You can provide opinions, but you must clearly state that they are opinions, and realize that they do not carry as much weight as verifiable data. This is not a debate! This is an enlightened, informed conversation taking place between respectful individuals. If the dialog becomes disrespectful or combative, it may result in a loss of points (at best) for the assignment. Remember that the context of this course is that we are investigating these artifacts in light of the ability of humans to live within the ecological limits of the planet! Do your best to stay within the framework of that theme. In addition to this, you will write a self-reflection paper in which you summarize the evolution of your thinking with regards to the material in the book. You will also provide an analysis of the rhetorical content of the book, and discuss this with fellow students. What is due this week and next week? After Week 1, you should have provided critical, substantive feedback on another student's post, and received feedback on yours as well. You must also have provided an analysis of the rhetorical content of the book. By the end of Week 2 of this lesson, you must respond to the feedback on your original post, and comment on one other student's rhetorical analysis. Check the list of requirements on the first page of this lesson and the syllabus to make sure you have completed all of the activities listed before the due date. Once you've ensured that you've completed everything, you are welcome to move forward with Lesson 11 (which is in Module 4, aka "The Final Module!"). Complete all activities in Lesson 10, located under the Modules tab in Canvas. For these assignments, it will be helpful to look at the rubric before answering. You will see a button that allows you to view it below the assignment.